Quora has that certain magic that only one or two startups a year have. When it first launched it seemed kinda dumb, a slightly better version of q&a sites from before, that all flailed into spam. But it became exceptionally clear very shortly that it wasn’t like those other sites. that the product, combined with the launch strategy of concentrating on a certain group of people (which is how facebook launched as well) made for a very nice product. Now the question is can they turn the corner. I think they will. This is where people with common interests will gather and exchange ideas. For example, for people seeking legal advice, there is LawPivot, and for businesses looking for experts, there is Focus. For techies, there are sites like StackOverflow, Slashdot, Hacker News; for children, there is Togetherville; for business students, there is PoetsandQuants; for entrepreneurs in India, there is StartupQnA; for Indian accountants, there is CAClubIndia; and China has its own groups, and so do many other countries. Indeed! So I added another bullet to my answer on How would Quora be different if it prioritized diversity. So I added something related to that too. Other ideas welcome. The people whose opinion I value, such as Quora’s #1 respondent, Robert Scoble, will simply stop posting on the site when they get drowned out by the noise from the masses. They will turn away after having their posts voted down (so that they look less important than their peers) and being personally subjected to the types of mindless, anonymous attacks that you see in the comments section of TechCrunch. Yes, if the best posts get voted down everybody will lose interest. If posters get attacked, they’ll leave (and Quora’s had some incidents already). But none of this is inevitable. Other sites have solved this; and Quora’s paying attention to all of these things — with rare exceptions, the tone is a lot more civil than TechCrunch. But when there are hundreds of answers to a given question, by people you have never heard of (often with fictitious names), how will you separate the wheat from the chaff? And how will you distinguish fact from fiction? You certainly can’t trust the rankings of the respondents when these rankings are themselves generated by Quora users. Once again, this is a problem that’s been solved by other sites — in a variety of ways. Naver, Yahoo Answers, Stack Overflow … all of these sites involve hundreds of answers and people with fictitious names. As if by magic, the wheat gets separated. Well-designed crowdsourcing works. Q&A is exactly the kind of task where diverse groups outperform. Unlike Facebook, where everyone socializes, and Twitter, where ordinary people tell their friends what they are thinking, a Quora-like tool is only for those who want to learn what their intellectual peers are saying on, or to research, a particular topic. Not really. 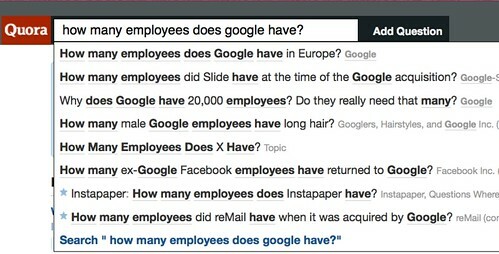 Most of the people who visit a Q&A site come via search or a link, and just want an answer to their question. Most of the participants come to give feedback on a piece of knowledge, and then the next step is to contribute something of your own or critique something somebody else has said. Quora only needs a relatively-small number of people hanging out there to be incredibly lucrative. So while I agree with Vivek’s overall conclusion — a lot of Kool-Aid is getting drunk here — my reasoning is different. Quora’s key challenge is to broaden their base beyond techie guys. They don’t seem to be doing anything about it. Look at things from a different prism, as an entrepreneur, this is pretty exciting news. The Q&A space is very attractive: Yahoo! 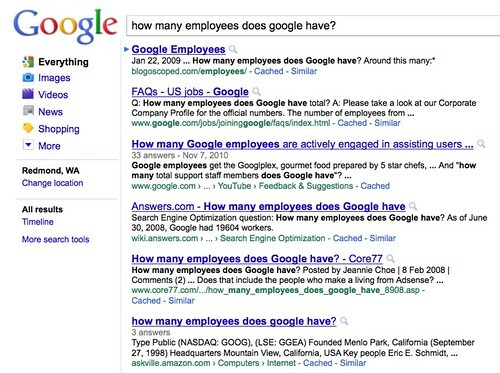 Answers and Answers.com have been top 20 web sites in the US — in early 2008 Yahoo Answers! was important enough that Oprah helped promote it and both Democratic presidential candidates posted questions there. * And with Google’s plummeting search quality highlighting the limitations of algorithmic search, there’s a chunk of the search market up for grabs. So it’s a very cluttered space; check out the lists of Quora competitors and other Q&A sites. How to stand out from the pack? Well, the most-hyped new general entry is Quora — who isn’t paying attention to diversity. Their prime contender StackOverflow has no female developers or designers and is starting from its base of excellent sites targeting the rather un-diverse audience of programmers and IT pros. So even if one or both of those sites together dominate the market for “techie guys and others who like the same kinds of user interfaces they do”, there are plenty of other audiences up for grabs. * Obama’s had over 17,000 responses, although if I recall correctly Oprah got more. Posted by jon on Sunday, January 23rd, 2011, at 1:55 pm, and filed under Professional. Who’s making search a verb? How do algorithmic, curated and crowdsourced techniques work together to solve the current challenges? What metrics should people track to see how much progress the industry is making on search quality? How effective will Duck Duck Go’s strategy of using privacy as a competitive advantage over Google be? And where do they think the technology opportunities are for new approaches that prioritize diversity? * rent, buy, recommend to friends, win an argument, link to in a blog post … in fact “link to” has gotten harder over the last year because Google now munges the URLs in their search results to improve their tracking and monetization. You know how I know Quora is going to be big? No one can shut up about it. Robert Scoble’s rant Why I was wrong about Quora as a blogging service threw some gasoline on the flames; Dan Kaplan of SalesForce responded with Sorry, Scoble, Quora is not your playground in Quora Review; Michael Arrington and MG Siegler jumped in on TechCrunch* [1, 2]; and then Robert replied with The mistakes I made in Quora. * for those keeping score at home, TechCrunch has now done at least four front-page posts on Quora in the last 10 days. Of course the last thing Quora needs at this point is more TechCrunch readers (or Scoble fans for that matter) as members — their challenge is to broaden there base. Still. Any publicity is good publicity. ** Speaking of which, Noam Cohen has a good article on Wikipedia’s gender-skewed contributions in the NY Times, with some great quotes from Jane Margolis (author of Unlocking the Clubhouse), amongst others. Aditi Muralidharan’s Digital Humanities and the Future of Search was one of the highlights of the Future of Search event. So was Esther Dyson’s talk (although it seemed to me that a lot of the panelists misunderstood her point about verbs). Marti Harris had great things to say too, including insights about the trend towards longer queries, the importance of collaborative work, and query building and results synthesis. Most of the media attention, though, when to the Microsoft/Google dustup Kara Swisher describes in The White Pleather Honeypot Smackdown and Vivek summarizes here. Rich Skedra from Blekko was on the panel too, and didn’t get to talk that much, but what he did say was interesting: their decision to ban “content mills” from their index, the surprisingly low hardware investment to do web-scale search these days, and the way they think of slashtags. And I don’t think anybody mentioned diversity. What a surprise. 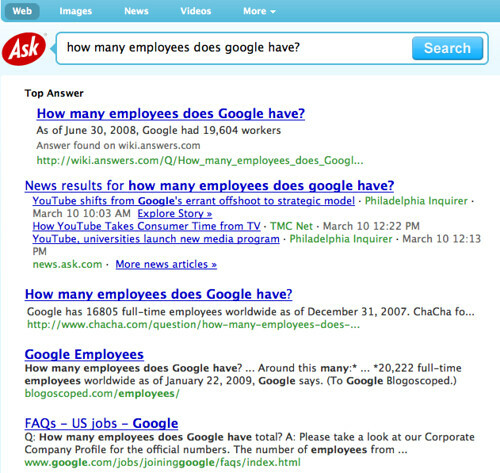 The debate about whether Microsoft is copying Google’s results has continued since then. I’ve thrown in a few comments on Hacker News, debating ethics with a Google engineer and talking about cognitive bubbles. And of course there’s discussion on Quora. Overall opinion is split, but there seems more support for Microsoft’s stance. Update, February 5: Danny Sullivan’s Bing: Why Google’s Wrong In Its Accusations is a good update, after a conversation with my former colleague Stefan Weitz. Juan Carlos Perez’ Google’s copying accusation called ‘silly’ in IT World quotes various people including Charlene Li, who notes “Google isn’t used to having competition. You look at this incident and you wonder why they are doing this. It feels amateurish in a way, a kind of ‘they’re not playing fair’ attitude Instead of making your competition look bad, something like this makes you look petty. This doesn’t reflect well on Google. I would think they would be above this.” And Kara Swisher’s Google’s Bing Attack Has Larry Page Written All Over It has some interesting comparison’s between Google’s new CEO and Bill Gates. * Answers.com has a distributed, disorganized workforce: 80% of its people work out of Jerusalem. * Answers.com revenues, which are 90% dependent on Google ads, took a sizeable hit when Google recently adjusted its search algorithm to fight search spam. * Management thought about hiring former Associated Content CEO Patrick Keane to full time to run the company, but Keane wouldn’t do it for less than a 6% stake. DuckDuckGo continues to impress. And sometimes editorial decisions are better than algorithms: since most users view most Demand Media articles as spam, DDG and Blekko get good results without investing a lot of engineering investment simply by banning them. Meanwhile Google had to work out algorithmic changes and test them at scale — with the risk that they unintentionally get rid of stuff from other sites that most people actually do want to see. So it’s a tough situation for Google, especially when you factor into account potential impact on all the advertising revenue they’re generating from these spam sites. “By contrast,” he adds, “How-to Q&A site Mahalo has $21 MM in financing, 105 employees but only 12 MM unique visitors (source: CrunchBase and BusinessInsider). eHow (which I sold to Demand Media) is about 3x larger but relies on 13,000 paid freelancers to produce over 1 million articles per year. Google has more pressing quality problems in product-focused areas, where it seems like the first ten search results are dominated by garbage product spam. Whatever you think of eHow, it’s generally better than that. Google continues to take some lumps. Experian Hitwise released a study claiming that users were significantly more likely to find a link worth clicking on via Bing and Yahoo! searches (81.5%) than Google (65.5%). Google’s Matt Cutts pushed back with some criticisms of the methodology, but the headlines mostly said “Bing beats Google”. When companies start to flail they nearly always do a couple of things. First, they trash the competitors. Then the talk about how hard the problem is and that the solution is a long term one. Altavista did a lot of that in the late nineties. Right before a competitor came in and fixed the the AltaVista problem permanently. Bing’s a little better: a thread from 2009 on the top, nothing else helpful in the top five. Ask is better yet, with a very helpful thread from 2010. Oh well. I asked the question, and we’ll see if I get any response. Useful, although without any voting or supporting comments it’s hard to know how much to weigh this opinion. That said the Quora result is far from the best information out there. After wading through a few links from Google a thread on DNForum from just a couple of weeks ago. So I’d say there’s still some room for improvement all around …. There have been signs over the past few months that Google is feeling the pressure to step up its social efforts — the +1 features it announced a week ago being just one of them. But the clearest indication yet is a memo from newly-minted CEO Larry Page that told employees their bonuses are effectively on the line if the company’s social efforts don’t work. The Google co-founder may see it as a carrot, but many of his employees are likely to see it as a stick — and you can’t threaten people into being social. I’m flashing! Back in 2006, the Ad Astra project proposed a strategy for Microsoft to outflank Google by leveraging its employee base and social technologies. One of the key insights: social computing technologies allow a company to tap into the combined energy of employees and their networks. This can be a huge asset — and one that potentially grows non-linearly as a company grows. Alas, Microsoft took another approach, investing in algorithmic search to compete with Google head-on, and ceding the social market to Facebook, LinkedIn, and others..
Five years later, it’s Google in the role of a large company trying to use its size as an advantage against a more nimble competitor. If Google’s 20,000+ employees can work together effectively and are sufficiently motivated, they’ll be a huge asset in the “battle for social.” Tying bonuses across the company to success gets everybody to focus on the company’s priority. From a strategy perspective, a great move by Google. Which doesn’t mean it will work. Google’s entire company is built around the cult of the algorithm, so “social” is antithetical to their successes so far. On Hacker News, Scott Burson did a great job of explaining the dynamics — so parallel to the ones at Microsoft in 2006. And as Mathew points out, it’s also a sign of how concerned Google is: they’re acting like they see their core business at risk. With their algorithmic search under assault by Microsoft (check out the last questions in Mike Swift’s interview with Matt Cutts) and their pattern of failure in social, will Google be able to evolve quickly enough? And how destabilizing will the process be? Larry’s moves after taking over as CEO are highlighting and raising the stakes. 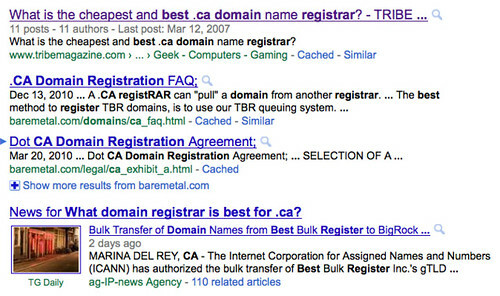 Ask.com and answers.com do noticeably better — the answer’s a little old but very clear. (If you look closely on the Google results above, this answer is buried in the text of #3.) Yay Q&A sites! Update, 3:45 p.m.: That didn’t take long.